Home / Parking Matters Blog / Networking: Are You Doing it Right? Networking: Are You Doing it Right? Extroverts find networking with strangers a joy, while the thought of it strikes dread into the hearts of introverts around the world. 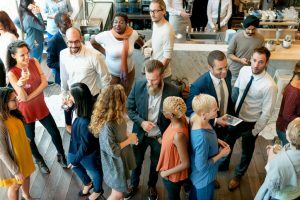 But one expert says there’s a way to both overcome the fear and ensure your networking efforts don’t go to waste—and even the extroverts are likely doing it wrong. Forbes contributor Bill Rader says doing some homework ahead of time is the only way to ensure heading out to meet new people is effective for everyone. Treating it as part of your job, finding appropriate events, and outlining specific goals for each one are critical, he says. And he has more advice for pre-networking preparation that he says virtually guarantees success—check it out here.